"Tally-oh to all sirs and madams! " 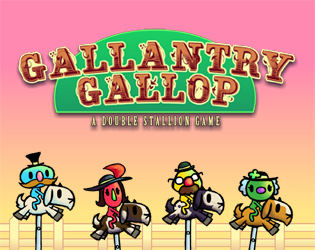 In Gallantry Gallop, four most-honored guests must win the race, but not at the cost of disrespecting High Host Lord Manderly! A quirky party racing game for 1 to 4 players (Xbox 360 controllers required). Players each play one of many festive goat riders competing in a friendly race. The rider with the most points at the end of the race is declared the winner! Alas! there are many different ways to earn or lose points! Earn points by saluting dames most fair, done by pressing the colored button corresponding to their own color. Left Joystick (Up/Down): Switch tracks. X, Y, A, B buttons: Trigger Polite actions. "May the best gallantry win the day! Tally-oh!"